Last year friends of ours were going out to the U.S.A. to see their son married. They were also meeting extended members of daughter-in-laws family. 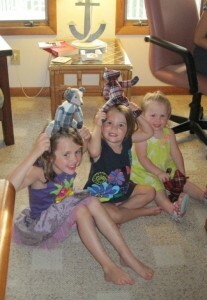 Knowing there were 3 wee girls to meet they asked if I could make 3 bears the same but in different tartans. As you can see in the first picture they were a little unsure what sort of creatures they were. They soon worked out that they were Scottish bears though. 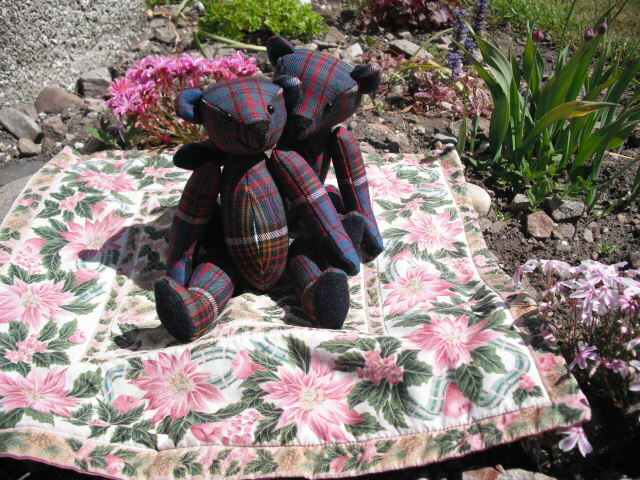 Had forgotten to add these pictures (parental approval gained) till I was asked to make another bear for the soon to arrive first child of the best friend of last years groom. It’s always lovely to see pictures of the bears new homes. Took my mother to the Spring quilt show at Ingleston on Friday. Given that she has had a recurring virus over the winter, we decided not to battle with the morning rush. We got there late lunchtime and found a place in the canteen to leave the chauffuer, otherwise known as my husband. Bought him an overpriced cup of tea and left him in the company of some quilters with his book and newspaper. Didn’t find the exhibited quilts terribly inspiring this time. It happens, we can’t all like every technique. I did find some seaside fabric which can be hard to come by. 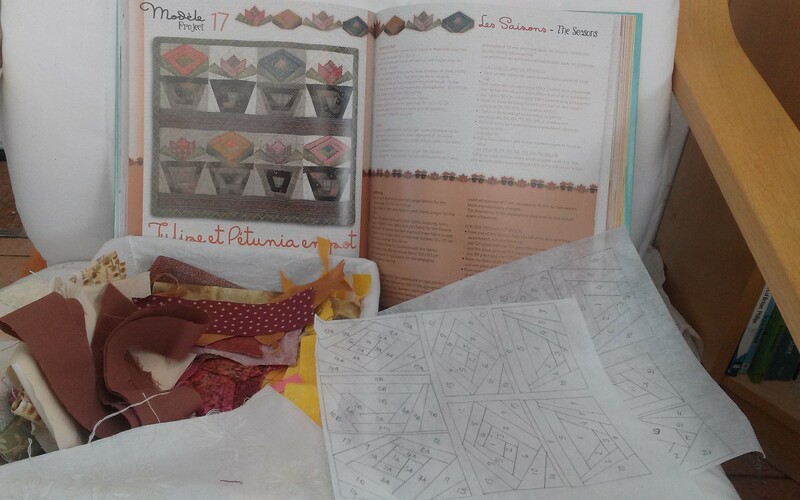 There is no firm project in mind but I get an urge every so often to do something So couple of fat quarters added to stash. Thought I was being rather frugal, even when I found the bookshop. Then, right up on the top shelf was a book I just had to have. SO many projects that I wanted to do. That led to purchsing needles and some hand dyed embroidery threads. First project has been chosen. I find paper piecing frustrating at times but the category I am entering in the local craft competition calls for patchwork and/or quilting. This project fits the bill. Scraps of fabric looked out. Diagrams drawn and numbered. Just got to get started now. This quilt featured in the Fabrications Quilting For You magazine that I picked up at one of the quilting exhibitions in Ingleston. Can’t remember if this was the reason for buying this issue but it eventually shouted to me. After one of my mothers recent fabric destashes I decided to have a go at it. I took it along to the craft group I go to in Buckie and one of the girls loved it so much she asked if I would scale it up to fit her king sized bed. I am still working on that one! This quilt has been on the go for a very long time. It was on of those projects that I would get a block on and forget to go back to it for long spells. 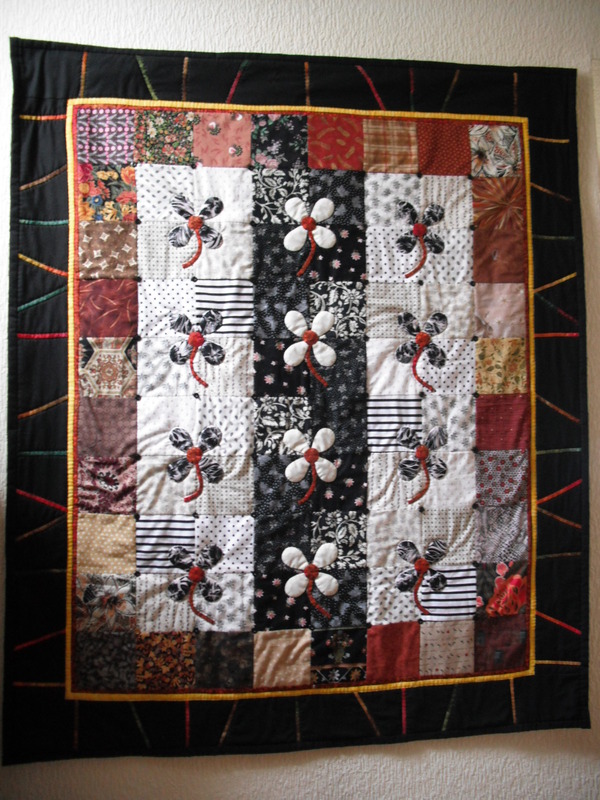 Eventually I got to the point where lot’s of hand quilting was what I needed to sooth me and this was the perfect piece for that. 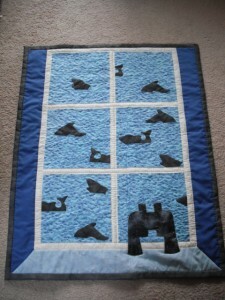 The waves in the water print provided plenty of scope for free quilting. I have never done so much quilting on one piece before. It was worth it though as it really makes the water stand out. This now hangs in my bathroom which has one long window in the corner. This quilt provides another window for the room. Wow. How did I lose a whole year? Well, it’s simple I suppose. 9 hour round trips to take parents for hospital treatments and basically checking up on them meant lot’s of things here were being shelved. We laughingly thought that once they were no longer with us that we would easily catch up on all the things we had half done or let lapse. Hah! we had underestimated how long it would take to dismantle what had been a very much lived in family home. My mother-in-law was a talented craft lady with many skills. Father-in-law was a collector of many items. Add to that that they belonged to an era where everything had a second and third use and you can imagine how much was in a two story family house with fully floored and furbished attic. Some 18 months later, with the help of the next generation we eventually discovered all there was to discover. The social history found in that house was amazing. It also provided us with more tasks and more agonies. What to do with it all. Who would want it? Our house was full enough with our own gathered posessions but theirs held so many memories. 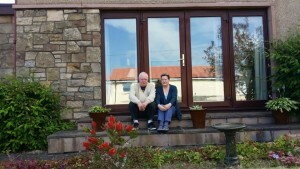 So we now find ourselves more and more in our own home. Emptying boxes, finding places for the cross stitch and decoupage framed works to hang. Catching up on all the jobs left undone for so long. Discovering I now have time to sit and go to all the wonderful places I used to go online. Time to finally get around to updating this site. I have made a new post, so that’s a start. Hopefully I will get some more things added in the coming weeks and see if I can make some more changes. 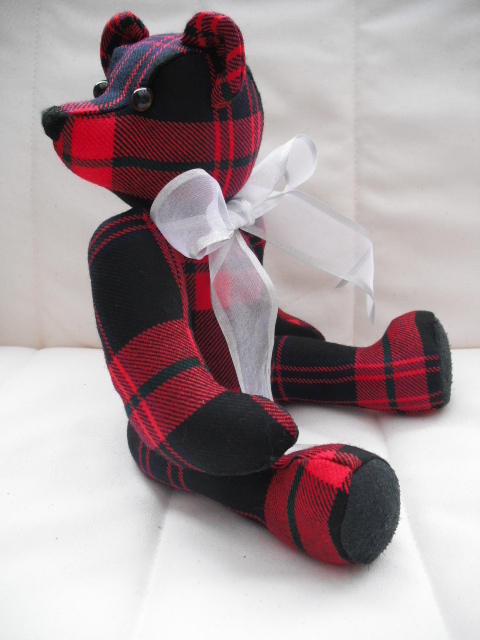 He has been made in the Brown family tartan. we believe he will shortly depart for Canada. An adventurous bear right enough! 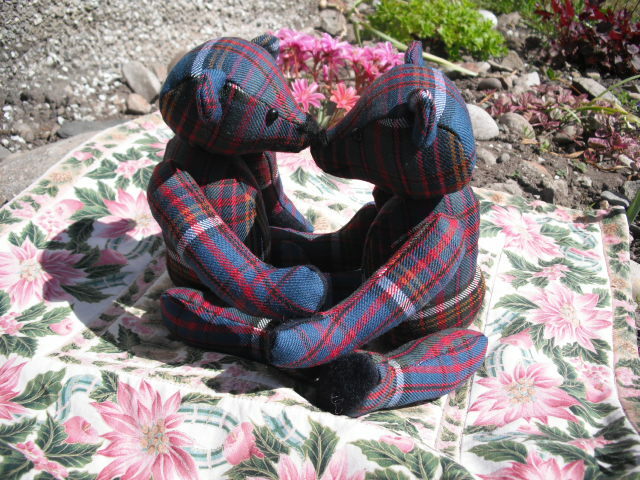 These bears were created as a lasting momento of a couples special day………………their wedding. 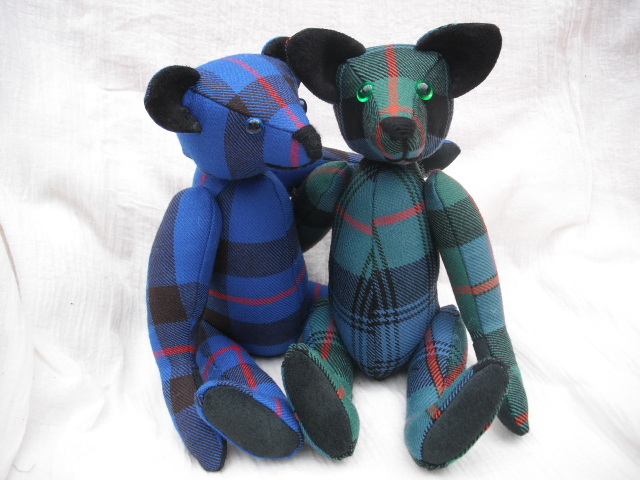 The bears can be both be made in the groom’s tartan or one can be the groom’s and one the bride’s. The bears will whatever you want them to be. I just use my experience to create what you want. Anither option would be to make them in tweed and adorn them with something made in the tartan. The possibilities end with your imagination. Thank you to those who stopped by the stall today at the Choctober event in Elgin Academy. If you picked up a card with the intention of buying online at some point or to contact me regarding a custom made item, please contact me using one of the links to the right of this page. With the weather starting to turn to Autumn my feet are starting to need something to warm them up. My feet hate being stuck inside shoes and boots for great lengths of time. They much prefer to carry on with open shoes with socks on. To this end I have been knitting socks and fingerless gloves as soon hands will need some warm garments too. Have found a great pattern that is long enough to keep fingers cosy while leaving the tips of the digits free to work and play. It also has a lacey pattern up the back of the hand which adds a touch of elegance. Hello to new passers by. I would like to say hello to anyone looking at this page because they have picked up one of my cards at a recent craft fair. 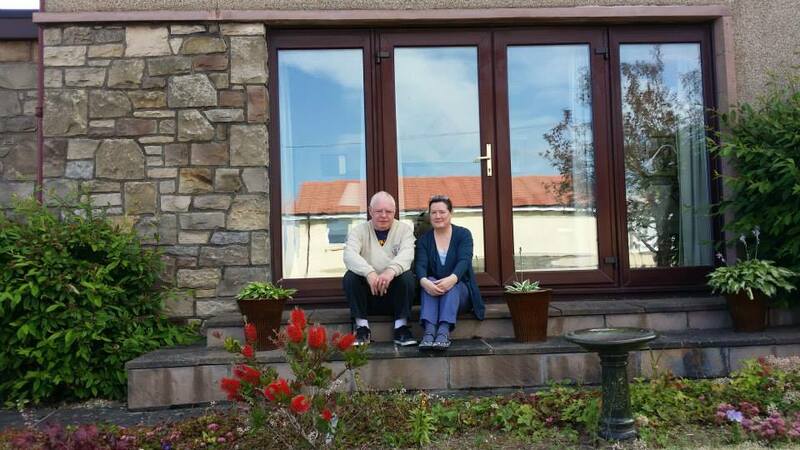 As you will see this is a blog (and not a regularly updated blog, LOL! ). I much prefer creating to paperwork and therefore you are more likely to find more regular updates on my facebook pages where I post pictures of what I am up to. You can link to these pages on the right of the page. I am currently looking at a site called Craft Barn which looks to be an easy site for shopperes and sellers alike to use. I will update you, (here and on facebook) as to how that goes. Today is focused around settign up the Buckie Townhouse for the Get Crafty event on Saturday. We are hoping to introduce non crafters to simple craft projects to show them everyone can do something. Come along between 10 a.m. and 2 p.m. if you would like to try something. 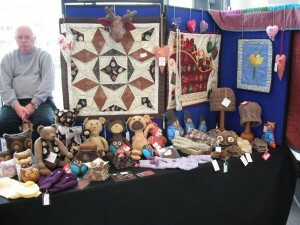 More info on the facebook page Buckie area arts and crafts group. Just as well they seem to get on then, or, like real brothers is this just a temporary state of loving feelings? You are currently browsing the slackstitches.com blog archives.